Tips From Donna Wesban Monthly October 2017 | Wesban Financial Consultants P.C. The opportunity to acquire company stock — inside or outside a workplace retirement plan — can be a lucrative employee benefit. But having too much of your retirement plan assets or net worth concentrated in your employer's stock could become a problem if the company or sector hits hard times and the stock price plummets. An employee's compensation could include stock options or bonuses paid in company stock. Shares may be offered at a small discount through an employee stock purchase plan, where they are typically purchased through payroll deductions and held in a taxable account. 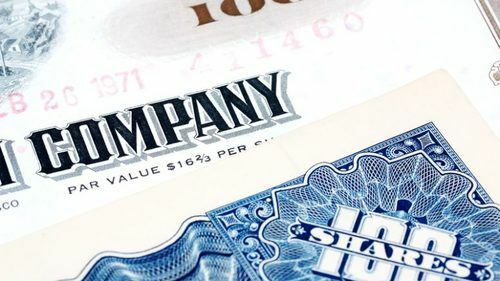 Company stock might also be one of the investment options in the employer's tax-deferred 401(k) plan, and some employers may match contributions with company stock instead of cash. Investors who build large positions in company stock may not be paying attention to the concentration level in their portfolios, or they could simply be ignoring the risk, possibly because they are overly optimistic about their employer's future. Retirement plan participants might choose familiar company stock over more diversified funds because they believe they know more about their employer than about the other investment options. If you work for a big company, you may also own shares of diversified mutual funds or exchange-traded funds that hold large positions in your employer's stock or the stock of companies in the same industry. Formulate a plan for diversifying your assets. This may involve liquidating company shares systematically or possibly right after they become vested. However, it's important to consider the rules, restrictions, and timeframes for liquidating company stock, as well as any possible tax consequences. An appropriate allocation of company stock will largely depend on your goals, risk tolerance, and time horizon — factors you may want to review with a financial professional. It may also be helpful to seek an impartial assessment of your company's potential as you weigh additional stock purchases and make decisions about keeping or selling shares you already own. It's a catch-22: You feel that you should focus on paying down debt, but you also want to save for retirement. It may be comforting to know you're not alone. According to an Employee Benefit Research Institute survey, 18% of today's workers describe their debt level as a major problem, while 41% say it's a minor problem. And workers who say that debt is a problem are also more likely to feel stressed about their retirement savings prospects.1Perhaps it's no surprise, then, that the largest proportion (21%) of those who have taken a loan from their employer-sponsored retirement plans have done so to pay off debt.2 Borrowing from your plan can have negative consequences on your retirement preparedness down the road. Loan limits and other restrictions generally apply as well. The key in managing both debt repayment and retirement savings is to understand a few basic financial concepts that will help you develop a strategy to tackle both. Probably the most common way to decide whether to pay off debt or to make investments is to consider whether you could earn a higher rate of return (after accounting for taxes) on your investments than the interest rate you pay on the debt. For example, say you have a credit card with a $10,000 balance that carries an interest rate of 18%. 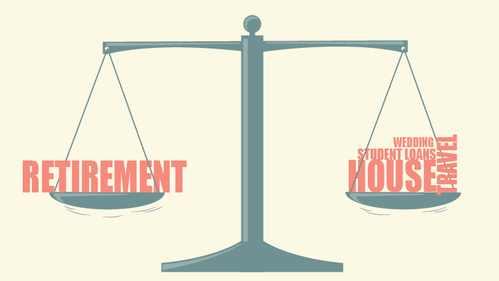 By paying off that balance, you're effectively getting an 18% return on your money. That means your investments would generally need to earn a consistent, after-tax return greater than 18% to make saving for retirement preferable to paying off that debt. That's a tall order for even the most savvy professional investors. And bear in mind that all investing involves risk; investment returns are anything but guaranteed. In general, the higher the rate of return, the greater the risk. If you make investments rather than pay off debt and your investments incur losses, you may still have debts to pay, but you won't have had the benefit of any gains. By contrast, the return that comes from eliminating high-interest-rate debt is a sure thing. Are you eligible for an employer match? If you have the opportunity to save for retirement via an employer-sponsored plan that matches a portion of your contributions, the debt-versus-savings decision can become even more complicated. Let's say your company matches 50% of your contributions up to 6% of your salary. This means you're essentially earning a 50% return on that portion of your retirement account contributions. That's why it may make sense to save at least enough to get any employer match before focusing on debt. Your decision can also be influenced by the type of debt you have. For example, if you itemize deductions on your federal tax return, the interest you pay on a mortgage is generally deductible — so even if you could pay off your mortgage, you may not want to. Let's say you're paying 6% on your mortgage and 18% on your credit card debt, and your employer matches 50% of your retirement account contributions. You might consider directing some of your available resources to paying off the credit card debt and some toward your retirement account in order to get the full company match, while continuing to pay the mortgage to receive the tax deduction for the interest. There's another good reason to explore ways to address both debt repayment and retirement savings at once. Time is your best ally when saving for retirement. If you say to yourself, "I'll wait to start saving until my debts are completely paid off," you run the risk that you'll never get to that point, because your good intentions about paying off your debt may falter. Postponing saving also reduces the number of years you have left to save for retirement. It might also be easier to address both goals if you can cut your interest payments by refinancing debt. For example, you might be able to consolidate multiple credit card payments by rolling them over to a new credit card or a debt consolidation loan that has a lower interest rate. Bear in mind that even if you decide to focus on retirement savings, you should make sure that you're able to make at least the minimum monthly payments on your debt. Failure to do so can result in penalties and increased interest rates, which would defeat the overall purpose of your debt repayment/retirement savings strategy. IS THE SOCIAL SECURITY ADMINISTRATION STILL MAILING SOCIAL SECURITY STATEMENTS? Your Social Security Statement provides important information about your Social Security record and future benefits. For several years, the Social Security Administration (SSA) mailed these statements every five years to people starting at age 25, but due to budgetary concerns, the SSA has stopped mailing Social Security Statements to individuals under age 60. Workers age 60 and over who aren't receiving Social Security benefits will still receive paper statements in the mail, unless they opt to sign up for online statements instead. If you're age 60 or older, you should receive your statement every year, about three months before your birthday. The SSA will mail statements upon request to individuals under age 60. However, the quickest way to get a copy of your Social Security Statement is to sign up for a mySocial Security account at the SSA website, ssa.gov. Once you've signed up, you'll have immediate access to your statement, which you can view, download, or print. Statement information generally includes a projection of your retirement benefits at age 62, at full retirement age (66 to 67), and at age 70; projections of disability and survivor benefits; a detailed record of your earnings; and other information about the Social Security program. The SSA has recently begun using a two-step identification method to help protect my Social Security accounts from unauthorized use and potential identity fraud. If you've never registered for an online account or haven't attempted to log in to yours since this change, you will be prompted to add either your cell phone or email address as a second identification method. Every time you enter your account username and password, you will then be prompted to request a unique security code via the identification method you've chosen, and you need to enter that code to complete the log-in process.